The musicians and players are: Paolo Spaggiari, Arianna Fiorini, Teresa Tresoidi, Mariagrazia Baraldi, Salvator de Lucia, Christian Pistoni, Marco Schiavetti, Cinzia Ghelefi, Luca Tavernelli, Paolo Succi, Lorella Rebucci, Carla Nasi, Ton! Toma, Claudio Cremaschi, Nicola Frignani, Simona Malagola, William Malagoli, Roberto Manicardi, Michele, Petriilo, Alessandra Barigazzi, Alessandra Fini, Sandro Cioni, Roberta Veronesi, Gianluca Pirrotta, Fabio Riva, Giampiero di Candia, Andrea Gualandi, Hubert Bergmann. The Instruments: Tambourin, Rassein, several drums, Woodxylophon, Metallxylophon, several Basswoodblocks, Woodsticks, Triangel, Tempelblocks, prepared piano, Guitarre, Voice. All pieces except (*) by Sandro Cioni are composed and directed by Hubert Bergmann. Produced by NAZARENO COOP. Sociale A.R.I. Via Bollitora Interne ,130 41012 Carpi (MO). Coproduction with:”Werkstatt fÜr improvisierte und neue Musik” Hafenstr. 10 D-88662 Oberlingen. while observing himself in action. We have discovered, playing music ,that we like. Each single music passage of this CD was not created for a “pleasant listening” as it happens for comercial music: instead, each note expresses the person who has felt something new in the reality that surrounds him. The aim of this CD-fruit of a seminar about “improvised music” and “instant composing” – was in fact that of stimulate the freedom of the subject, that is new desires which would have been satisfied together. The work done was a special occasion for our guys to get a deeper knowledge of themselves as weil as joy reality through something newly incorporated music. Music created mouvement, opened towards something new and beneficial. That’s why we can speak of aesthetical experience. Friedrich Nitzsche begins one of his famous works with this sentence: “Since just thanks to aesthetic events, both our experience and our world have their reason forever …. ” The musical seminar was a pleasant unexpected event which gave us the possibility of knowing something beyond our usual reality. creator of a method introducing to the composition based on various structures of instant music called “CODE-MUSIC” . In all that, the most important aspect is the attitude while playing music, and not only with pieces composed by other persons, but also opening oneself to a spontaneous search for a musical resolution. Composition of instant music and strenghening of a musical language expressing “stories of moments”, are the most important interests. “Change” as the begining of a new originally language. That kind of performance can be considered as the equivalent of an interpretation of live, which consists of various and changing aspects, and which is an attempt for a conscious work in it. Auf Nietzsches Diktum von einer Erlösung im Scheine und dass das Dasein und die Welt nur als ästhetisches Phänomen gerechtfertigt seien, dem ein blutiger Dezisionismus zugrunde liegt, auch eine ‘Pataphysik avant la lettre, jedenfalls kein Werbekalkül, beruft sich SOGNI DI GIORNO. Music of NAZARENO People (mudoks nr. 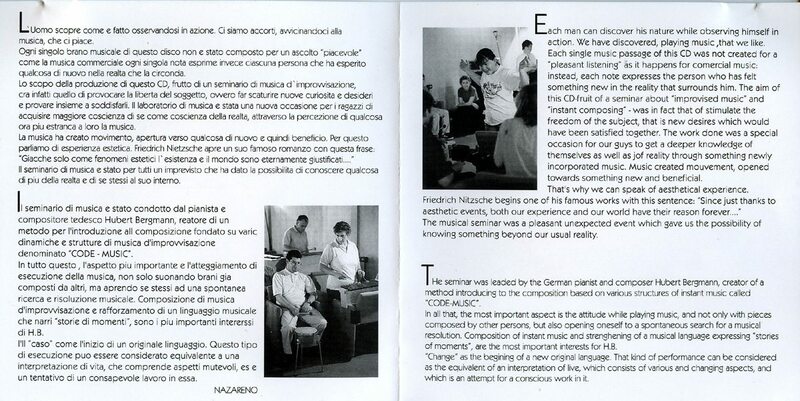 023-13129) ist das Resultat eines Bergmann‘schen ‚Code-Music‘-Seminars anno 1999. Ein koedukatives italienisches Orff-Gamelan umarmt Bruder Klim und Schwester Bim, Bruder Tok und Schwester Rassel. Ästhetik als Seelenarbeit und Verteidigung der Kindheit? Oft genug ist sie ein fliehendes Pferd, aber manchmal doch ein springender Brunnen (um nochmal einen Walser-Takt anzuschlagen).